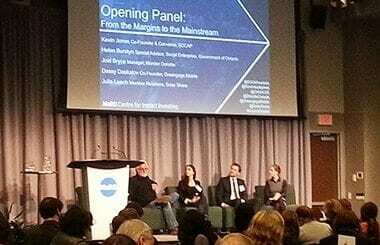 After months of planning and preparation, 25 ventures and over 120 impact investors took part in last week’s Impact Ontario conference, hosted by the MaRS Centre for Impact Investing in partnership with the Government of Ontario and Social Capital Markets. 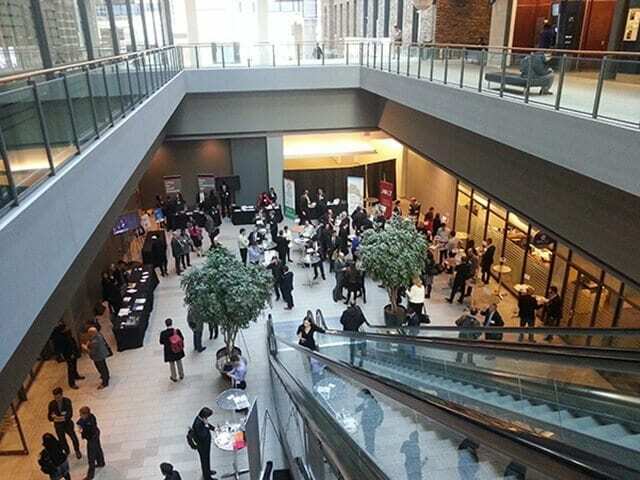 Three hundred national and international delegates participated in the sold-out event, learning about Ontario’s impact-investing landscape and meeting Ontario’s impact entrepreneurs. Impact Ontario featured both closed and open pitch sessions, as well as practical workshops focused on building capacity for impact-investing transactions, structuring deals and measuring impact. The workshops were coupled with insightful plenary keynotes featuring renowned global leaders such as Geoff Burnand, CEO of Investing for Good, and Michael Chodos, senior advisor of the United States National Advisory Board on Social Impact Investing. 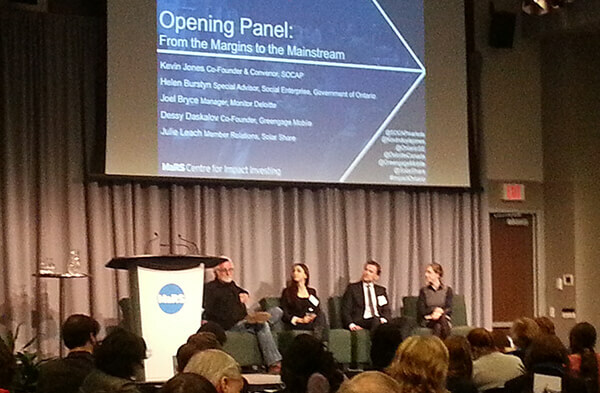 Impact Ontario engaged investors, impact ventures and funds, and shed light on the successes and trends of the sector. More importantly, the conference provided insight on what we can expect to see next in impact investing. Here are my takeaways on where impact investing is going and what’s becoming of this once nascent space. They shared how the Canadian impact-investing space has evolved and encompasses an array of industries and sectors. Whether it is clean technology, aboriginal businesses or medical devices, the pathways to achieving impact are becoming more clear and easier to identify. We’re also seeing more impact investors formulate specific impact-investment theses and approaches, like panellist Richard Osborn, who described his investment strategy and approach as managing partner of RecapHealth Ventures. It may seem counterintuitive, but it’s easier to be a newcomer to impact investing now than it was when everyone was a newcomer. Even though impact-investing sectors and approaches are becoming more defined, they are not becoming exclusive. These definitions provide the framework to support new stakeholders who are looking to enter the sector as investors, ventures or intermediaries, because there are many more examples and leaders to learn from. It’s also much easier to find like-minded investors and values-aligned peers than it was five or six years ago. Whether you’re an angel investor, a fund manager or a foundation, it’s easier now to connect with and learn from existing impact angels, impact fund managers and foundations engaged in impact investing. This facet came to light at Impact Ontario as we saw many connections being made, including investor to venture, investor to investor and venture to venture. Keynote speaker Abigail Noble, head of impact investing at World Economic Forum and author of “From the Margins to the Mainstream: Assessment of the Impact Investment Sector and Opportunities to Engage Mainstream Investors,” discussed how impact investing is making its way into the mainstream. She shared her enthusiasm for catalysts such as B Lab that have ignited mainstream interest from leading financial institutions and governments. She also shared how catalysts and collaboration are critical to the mainstream success of impact investing. Being collaborative allows for increased opportunities to share risk through the creation of innovative funding models. These models include layered tiers of funding with varying risk, return and impact profiles to support a wider array of impact-investment approaches that, in turn, can and are being adopted by the mainstream. Impact Ontario convened leading impact ventures, impact investors and intermediaries to highlight the opportunities for impact investing in Ontario, while also demonstrating the tremendous growth of the sector to date. By enabling learning directly from experienced impact investors and ventures, the event was a culmination of past successes, key insights and future trends that will continue to drive and support the flow of capital to impact ventures and funds.